Two cars of equal mass approach an intersection. Car A is moving east at a speed of 45 m/s. Car B is moving south at a speed of 35 m/s. They collide inelastically and stick together after the collision, moving as one object. Which of the following statements is true about the center-of-mass velocity of this system? The center-of-mass velocity will decrease after the collision as a result of lost energy (but not drop to zero). The center-of-mass velocity will drop to zero since the two objects stick together. The magnitude of the center-of-mass velocity will remain the same, but the direction of the velocity will change. This is College Physics Answers with Shaun Dychko. The only thing that can change the velocity of the center of mass is a net external force. 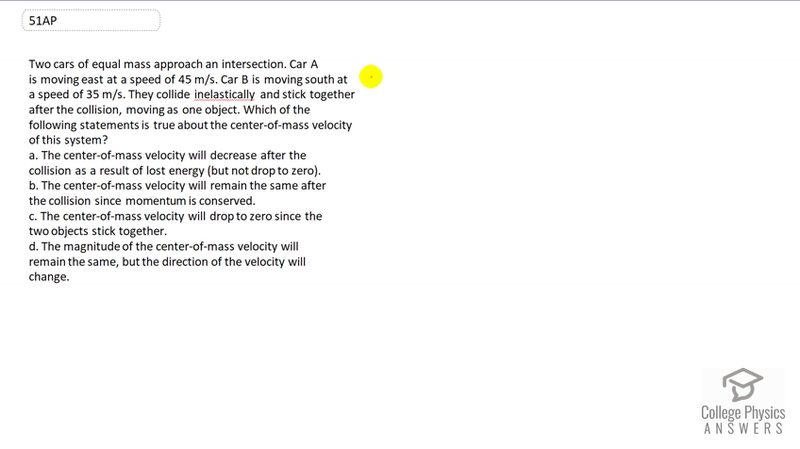 In this case, there doesn't appear to be any friction acting on it so we can say that the center of mass velocity will remain the same after the collision.